I touched on this issue a couple of years back when it initially happened but at the time I didn't realise the lasting effect it would have on me as both a driver and passenger. In 2015 we had a car accident, one of the worst kind and one you don't normally survive to tell the tale from. A lorry hit us, a heavy goods vehicle at 50 miles per hour, with a one year old Noah in the backseat. Terrifying. We were lucky though, thank heavens we escaped with nothing but a horrendous memory - I didn't even have whiplash. Someone was definitely watching over us that day. Since that day it's made me so aware of many things I really took for granted before. I guess you could say I was complacent before the accident, we'd made that journey down to see my sister and brother in law and it was a five hour round trip. Did we check the oil? No. Did we check the coolant? No. Did we check the tyres? No. We just simply hopped in our car and headed off. Granted the accident wasn't our fault and the driver admitted that he simply tried to overtake us in a 50 zone and 'forgot' we were there. Thus moving in and essentially doing a pitt maneuver on us. Thank heavens the driver managed to stop almost instantly as Johns driver door was hanging off and had he continued to push us up the m62, I'm certain the car would have rolled or John would have been seriously injured as his door would have fallen off. Ironically after the incident I thanked the driver because it could have been worse and though his initial mistake caused the issue he limited the trauma with his quick thinking and stopping. It really got me thinking and still does to this day, car safety is so incredibly important. We all make sure our airbags are enabled and our seat belts are on, but truthfully when was the last time you checked your tyres? I owned my previous car for 2 years and I don't believe I checked them once. How ridiculous and stupid is that? Had that Lorry not had a service and fresh tyres on just 3 weeks prior to our collision perhaps I wouldn't be here typing this blog post right now. The Road Safety Authority conducted a survey last year which found out of 100 fatal crashes where the fault lay with the car, 66% of those were due to poor tyres. 66% of those lives could have been saved by simply checking their tyres. Recently we took a trip to Wales, a good 7 hour trip there and 5 hours back. Obviously I had learned from my mistakes and John gave the car a thorough checking before we left each destination. We now make sure we stick to the advised check of once a month for our tyres, because I certainly don't want to up our chances of being in any similar situation. It's also quite important to familiarise yourself with you car and what it needs. I'd been driving a mere 5 months when I clipped my tyre on a curb and caused a puncture. At the time both me and John were completely clueless on how to change my tyre even though I had a spare. Dad to the rescue and now we're both pretty confident if the situation arose again we would know what to do. Tyres don't always puncture though before they need changing, keep an eye out for any bulges or bumps, as well as the ensuring you haven't fallen below the minimum tread depth as both of these are red flags and a sign you probably need to change your tyres. Tyres in Solihull and all over the UK are stocked at Point S or I've even used Kwik Fit before. Lastly I'd really recommend knowing your PSI, John had a slow puncture in his car not too long ago and we couldn't find the manual, neither of our phones had signal and we felt a bit silly wandering into a garage to ask them - thankfully they were stars and helped us out. 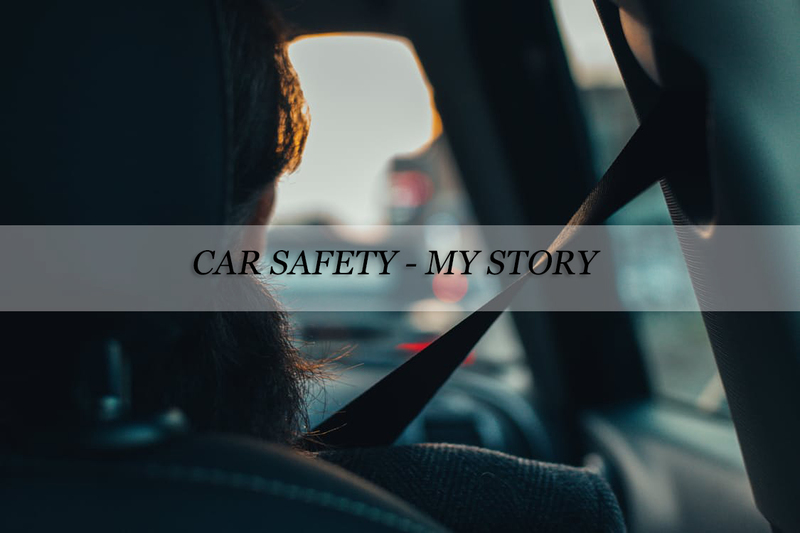 Car safety is so much more than clicking your belt on and making sure your little ones are in their car seats, I was incredibly naive to that and I guess I am slightly thankful to our incident for raising my awareness and making me as cautious as I initially should have been. We live just off an incredibly busy and saturated A1, to leave or enter our village we must use that road, which we do daily. We're also aware of the accidents that happen every single week, some are lucky like us and others lose their lives, we really don't want to be a statistic so whenever we make a trip now, car safety is our priority. The crash sounds very scary, just glad to read that you guys were all OK. How horrible to experience that though. It is frightening that so many cars haven't been checked before making long distance journeys. My parents always taught me the basics even before I got my licence, which I am very grateful for. It's worth adding that if you feel overwhelmed by the checks you should be doing, most local garages will do the checks for you, sometimes totally free. That sounds terrifying. I'm glad you were all ok. My sister had a foreign lorry driver drive into her on the motorway a few years back and wrote her car off. She hasn't driven since as she is too scared. So scary Em! Thank goodness you were all ok.
Super important to have them checked you're right!! I don't drive but totally can see why this is important! Gosh your crash sounds scary! I'm pretty good at checking my tyres but I'll admit I'm horrendous at remembering to check my oil - I should just do it at the same time shouldn't I!? Ignoring the proper care of your car's tire may leads to create a major problem when you are on the road. So do a regular basis check on your car. As you are a car rider keep some knowledge about the tire changing if any break down occur due to tire. Keep an eye out for any bumps ensuring you haven't fallen below the minimum thread depth.